A Democrat who spoke to Gov. Ralph Northam said Northam won't resign. The calls to step down came after his 1984 EVMS yearbook page showing a picture of him and someone else in blackface and a Ku Klux Klan outfit surfaced. NORFOLK, Va. — A Virginia Democrat who has spoken with Gov. Ralph Northam has told The Associated Press that the governor now does not believe he was in a racist picture in his 1984 medical yearbook and has no immediate plans to resign. The Democrat was not authorized to speak on the record to detail a private conversation. Northam is calling state lawmakers Saturday to try and gain support so he can remain in office, the Democrat said. 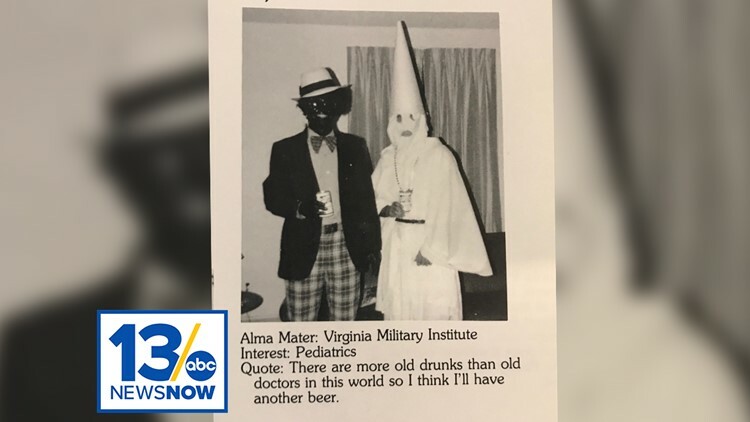 Northam has faced a torrent of criticism and calls for his resignation after a photo surfaced from decades ago that showed two people in racist costumes: One person is dressed in blackface, and another is wearing a full Ku Klux Klan uniform. The photo appeared in Northam's 1984 medical school yearbook. On Friday, Northam apologized for appearing in the photo. On Saturday, Virginia Democrats sent out a tweet that it had spoken to Northam and asked him to "do the correct thing and resign this morning - we have gotten word he will not do so this morning." Cliff Hayes, a member of the Virginia Legislative Black Caucus said he met with Northam on Friday night. "Governor Northam said 'I do not remember this, I just do not remember this,' and that being said, we’ll have to hear the rest of the story but he did say 'he just does not remember this,'" Hayes said. In a video statement Friday, the governor said he is "ready to do the hard work of regaining your trust" and apologized for the "racist and offensive attitudes" reflected in the photo. He added that what is pictured does not reflect the person he is today. Northam made no mention about calls for his resignation. The page in the EVMS yearbook features several photos of the governor. Alongside the photos where Northam is identified clearly, a photo of a person in blackface and another in a KKK hood is shown. The two individuals are both holding a canned drink. Underneath it is text listing his undergraduate alma mater, Virginia Military Institute, along with a quote: "There are more old drunks than old doctors in this world so I think I'll have another beer." Northam did not specify which person he was in the picture, only that he was in it. Soon after the EVMS yearbook photo started making rounds online, people began to question the meaning of a nickname that appears under Northam's yearbook picture from VMI. In a statement to ABC News, EVMS Director of Marketing and Communications Jennifer McCarrall said, "I can confirm the picture in question does appear in a 1984 student-produced publication. The EVMS library is open to the public and does provide access to its materials." The Democratic governor recently has come under fire from Republicans for supporting looser restrictions on late-term abortions. "Racism has no place in Virginia," Republican Party of Virginia Chairman Jack Wilson said. "These pictures are wholly inappropriate. If Governor Northam appeared in blackface or dressed in a KKK robe, he should resign immediately." SEE ALSO: She wore blackface. What's the big deal? Here it is. The Virginia State Conference of the NAACP planned a news conference for Saturday and said that Northam should resign immediately. This photo is shocking and deeply offensive, all the more so because of Virginia's long and painful history of racism and violence toward African Americans. The Governor must now listen to the people and communities he has hurt, and carefully consider what comes next. The racist photo from Governor Northam’s 1984 yearbook is horrible. This causes pain in a state and a country where centuries of racism have already left an open wound. I hope the Governor — whose career as an Army officer, pediatrician and public official has always manifested a commitment to justice and equality for all — now takes the time to listen to those he has hurt and reflect on how to move forward. Congressman Denver Riggleman tweeted a response to the photo, "As a Virginian & Rep. of Charlottesville, @GovernorVA yearbook photos hit more than a nerve. This Virginian demands an explanation. Now. Issues of racial discrimination cannot be taken lightly & this type of behavior is dangerous & unacceptable in any form." U.S. Senator Kamala Harris called for the governor to resign on Twitter. On Twitter, Congresswoman Elaine Luria asked Governor Northam to resign. "There is no place for Gov. Ralph Northam’s racist actions. Both NEA and VEA strongly condemn them. This goes beyond political affiliation. We must set a better example for our students. The public must have trust and confidence that their elected officials will fight for them, and that trust has been irreparably damaged. Ralph Northam should resign."